Saint Andrew (first century C.E.) (Greek: Ανδρέας, Andreas, "manly, brave"), called Protocletos, or the First-called in the Orthodox tradition, was a Christian Apostle and the younger brother of Saint Peter. He was renowned for bringing Christianity to Romania, Ukraine, and Russia, and is said to have been crucified on a Saltire cross in Patras, Greece. Andrew is esteemed as an example of humility for the fact that he refused to be crucified on the same type of cross as Christ because he was not worthy. Many countries venerate Andrew as their patron saint including Scotland, Russia, and Romania. It is also held that Andrew founded the See of Byzantium in 38 C.E., where he installed Stachys as bishop. This See would later develop into the Ecumenical Patriarchate of Constantinople, and Andrew is its patron saint. In both the Eastern and Western churches, the feast of Saint Andrew is observed on November 30 and it is the national day of Scotland. According to Christian sources, Andrew was born at Bethsaida on the Sea of Galilee (John 1:44). 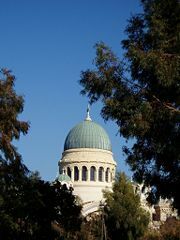 Later, he lived at Capernaum (Mark 1:29) where he was likely exposed to Greek influences. Andrew and his elder brother Peter were fishermen by trade and they were the first apostles to be appointed by Jesus. 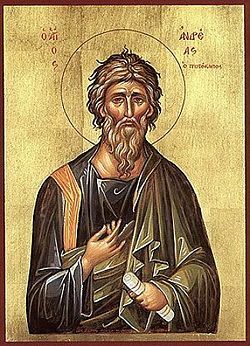 Consequently, Andrew is often called Protocletos, or the "first-called"; in the Eastern Orthodox tradition and he is described as being one of the disciples more closely attached to Jesus (Mark 13:3; John 6:8, 12:22). After the crucifixion and Pentecost, Andrew allegedly preached in Asia Minor and in Scythia, along the Black Sea as far as the Volga and Kyiv. Due to his travels in these lands, he subsequently became known as the patron saint of Romania and Russia. Additionally, it is held that Andrew founded the See of Byzantium in 38 C.E., which would later develop into the Patriarchate of Constantinople. Andrew is still its patron saint. It is said that Saint Andrew, refusing to be crucified on the same type of cross as Christ because he was not worthy, was martyred on an X-shaped cross. It is said that Andrew was martyred by crucifixion at Patras in Greece (c. 60-70 C.E. ), on a cross of the form called Crux decussata (X-shaped cross) and commonly known as "St. Andrew's cross," at his own request, as he deemed himself unworthy to be crucified on the same type of cross on which Christ was crucified. According to tradition his relics were removed from Patras to Constantinople, and thence to St. Andrews. Local legends say that the relics were sold to the Romans by the local priests in exchange for the Romans constructing a water reservoir for the city. The head of the Saint Andrew, considered as one of the treasures of St. Peter's Basilica, was given by the Byzantine despot Thomas Palaeologus to Pope Pius II in 1461. In recent years, the relics were kept in the Vatican City, but were sent back to Patras by decision of the Pope Paul VI in 1964. The relics, which consist of the small finger and part of the top of the cranium of Saint Andrew, have since that time been kept in the Church of St. Andrew at Patras in a special tomb, and are reverenced in a special ceremony every November 30. Saint Jerome (c. 342 –419) wrote that the relics of Andrew were taken from Patras to Constantinople by order of the Roman emperor Constantius II in 357. In 1208, the relics were taken to Amalfi, Italy, by Pietro, cardinal of Capua, a native of Amalfi. In the fifteenth century, the skull of Andrew was brought to Rome, where it became enshrined in one of the four central piers of Saint Peter's Basilica in the Vatican. In September 1964, as a gesture of good will toward the Greek Orthodox Church, Pope Paul VI returned a finger and part of the head to the church in Patras. The Amalfi cathedral, dedicated to Andrew (as is the town itself), contains a tomb in its crypt that it maintains still contains the rest of the relics of the apostle. The apocryphal “Acts of Andrew,” as well as a “Gospel of St. Andrew,” appear among rejected books in the Decretum Gelasianum connected with the name of Pope Gelasius I. The Acts of Andrew was edited and published by Constantin von Tischendorf in the Acta Apostolorum apocrypha (Leipzig, 1821), putting it for the first time into the hands of a critical professional readership. Andrew was selected by Jesus to be an apostle. In Christianity, an apostle (Greek: Ἀπόστολος apostolos; meaning "messenger") designates an individual commissioned by God to spread the "Good News" of the Christian message to the world. Normally, the term applies to one of the Twelve Apostles ... listed in the New Testament, who were chosen by Jesus to heal the sick, drive out demons, raise the dead (Mark 6:7-13, cf. Matthew 10:5-42, Luke 9:1-6), and to spread his message. The status of the apostles in the early church was penultimate to Jesus himself, for Jesus had given them power to teach in his name. Many Christian churches still base their authority on the premise of Apostolic Succession (ecclesiastical authority derived from being founded by an apostle). According to Eastern Orthodoxy, Andrew founded the See of Byzantium in 38 C.E., which would later develop into the Patriarchate of Constantinople. Early Christian history in Ukraine holds that the apostle Saint Andrew is said to have preached on the southern borders of Ukraine, along the Black Sea. Legend has it that he traveled up the Dnieper River and reached the future location of Kiev, where he erected a cross on the site where the Saint Andrew's Church of Kiev currently stands, and prophesied the foundation of a great Christian city. Romanians believe that Saint Andrew (named Sfântul Apostol Andrei) was the first who preached Christianity in Scythia Minor, modern Dobrogea, to the native people of the Dacians (ancestors of the Romanians). This is the official standpoint of the Romanian Orthodox Church. Hippolyte of Antioch, (died c. 250 C.E.) in his On Apostles, Origen in the third book of his Commentaries on the Genesis (254 C.E. ), Eusebius of Caesarea in his Church History (340 C.E. ), and other different sources, like the Usaard's Martyrdom written between 845-865, Jacobus de Voragine in Golden Legend (c. 1260), mention that Saint Andrew preached in Scythia Minor. There are toponyms and numerous very old traditions (like carols) related to Saint Andrew, many of them having probably a pre-Christian substratum. There exists a cave where he supposedly preached. About the middle of the tenth century, Andrew became the patron saint of Scotland. Several legends state that the relics of Andrew were brought under supernatural guidance from Constantinople to the place where the modern town of St. Andrews stands. The oldest surviving manuscripts are two: one is among the manuscripts collected by Jean-Baptiste Colbert and willed to Louis XIV, now in the Bibliothèque Nationale, Paris, the other is in the Harleian Miscellany in the British Library, London. They state that the relics of Andrew were brought by one Regulus to the Pictish king Óengus mac Fergusa (729–761). The only historical Regulus (Riagail or Rule)—the name is preserved by the tower of St. Rule—was an Irish monk expelled from Ireland with Saint Columba; his date, however, is c. 573–600. There are good reasons for supposing that the relics were originally in the collection of Acca, bishop of Hexham, who took them into Pictish country when he was driven from Hexham (c. 732), and founded a See, not, according to tradition, in Galloway, but on the site of St. Andrews. The connection made with Regulus is, therefore, due in all probability to the desire to date the foundation of the church at St. Andrews as early as possible. Another legend says that in the late eighth century, during a joint battle with the English, King Ungus (either the Óengus mac Fergusa mentioned previously or Óengus II of the Picts (820–834)) saw a cloud shaped like a saltire, and declared Andrew was watching over them, and if they won by his grace, then he would be their patron saint. However, there is evidence Andrew was venerated in Scotland even before this time. Andrew's connection with Scotland may have been reinforced following the Synod of Whitby, when the Celtic Church felt that Columba had been "outranked" by Peter and that Peter's older brother would make a higher ranking patron. The 1320 Declaration of Arbroath cites Scotland's conversion to Christianity by Saint Andrew, "the first to be an Apostle." Numerous parish churches in the Church of Scotland and congregations of other Christian churches in Scotland are named after Saint Andrew. The purported relics of Andrew are kept at Saint Andrew Basilica, Patras, Greece; Sant'Andrea Dome, Amalfi, Italy; Saint Mary's Cathedral, Edinburgh, Scotland; and St. Andrew and St. Albert Church, Warsaw, Poland. Today, Saint Andrew continues to be the patron saint of Scotland, Russia, Romania, Amalfi, and Luqa (Malta). Many national flags depict the cross on which he was crucified and thus bear a testament to him. For example, the flag of Scotland (and subsequently the Union Jack and the flag of Nova Scotia) feature a saltire in commemoration of the shape of Saint Andrew's cross. The saltire is also the flag of Tenerife and the naval jack of Russia. The feast of Andrew is observed on November 30 in both the Eastern and Western churches, and is the national day of Scotland. In the traditional liturgical books of the Catholic church, the feast of St. Andrew is the first feast day in the Proper of Saints. Saint Andrew remains very important in the Greek Orthodox tradition since he is seen as the founder of the See of Constantinople, and the source of apostolic succession in this church. He also remains a popular representation in icons and is a common name for boys in various countries with predominately Christian populations. ↑ Historically, Saint Andrew was also the patron saint of Prussia when it existed as an independent entity. ↑ Andrew (or Andreas) is itself a Greek name. He likely had another Hebrew or Aramaic name but none is recorded for him in the Bible. ↑ Hence the tradition that Jesus called them to be his disciples by saying that He will make them "fishers of men" (Greek: αλιείς ανθρώπων, halieis anthropon). Bruce Metzger and Michael D. Coogan (eds. ), The Oxford Companion to the Bible, (Oxford: Oxford University Press, 1993), p. 27. ↑ Some scholars read this more metaphorically as instructions to heal the spiritually sick and thus to drive away wicked behavior. ↑ cf. Nicolae Dură, Christianism in Pontic Dacia in Revue Roumain d'Histoire, XLII, no. 1-4, pp. 5-17, Publishing House of the Romanian Academy, Bucharest, 2003. ↑ cf. Rebeka Ceravolo, An Iconographic analysis of the retable of saints Andrew and Antonin of Pamier, University of Toledo, Ohio, 2003, p. 20 (pdf). Retrieved June 19, 2007. ↑ The Declaration of Arbroath Retrieved May 16, 2007. ↑ National Shrine of Saint Andrew. St Mary's RC Cathedral, Edinburgh. Retrieved May 16, 2007. All links retrieved August 5, 2015. This page was last modified on 5 August 2015, at 20:28.